FINIS Freestyle Snorkel is rated 4.3 out of 5 by 4. Rated 4 out of 5 by jymbag from Good value I've been using the Finis freestyle snorkel for a few weeks now and it works well. Not having to frantically squeeze in a breath between focusing on your stroke and posture in the water is nice. This one doesn't have a release value to blow out water after a flip turn so you need a good blast of air to push any water that gets in all the way up the tube. The fit isn't perfect for me and the mouth piece hurts my upper gum a bit. Hopefully over time it will loosen up. Over all a good product. Rated 4 out of 5 by fkohler from Good training aid I use this pretty much everytime i swim now. I find it really works my breathing and as a benefit, allows me to focus on my stroke. 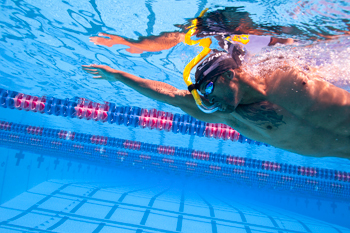 I use in conjuction with the Finis Freestyle paddles and its a great combination on a 30 mins workout. Rated 5 out of 5 by LeeJG from excellent swim tool the tool has helped my body / head position. it is simple to use and does exactly what it is supposed to.